The universe doesn't do medium. In terms of what turns heads, you're either very, very big (think galactic clusters) or very, very small (think neutrinos and bosons). That's long been assumed to be the rule for black holes too. For 30 years, astronomers have been looking for evidence of a theorized class of black hole that would be sort of a cosmic middle child, falling somewhere between the well-established smaller ones  which are "only" 30 times the mass of our sun  and the supermassive types that are the equivalent of millions of solar masses. There's more than just a taste for cosmic tidiness behind the hunt. These so-called intermediate-mass black holes could provide an important link in the life cycle of all black holes, suggesting that the mini and jumbo models are not two completely different species but rather members of a single species at different stages of maturation. Now there is evidence that medium-size black holes might indeed exist  courtesy of an X-ray blast from a mysterious body 290 million light-years from Earth. It was three years ago that astrophysicists discovered the object they straightforwardly dubbed Hyper-Luminous X-ray source-1 (HLX-1), so named because it emits 260 million times the X-ray brightness of our sun. But the nature of the object was a head scratcher  mostly because it was invisible. It couldn't be a foreground star or a background galaxy. That meant it was probably  though not definitely  a black hole, since the gasses and other material being pulled into the body would produce X-rays as a byproduct. The intensity of the emissions put the black hole's size at 500 times the sun's mass, which would place it in the long-sought intermediate range. But while potent X-rays are characteristic of black holes, they're only half of a two-part signature. In the vicinity of other black holes, astronomers witness a violent reaction to so much incoming gas: the region belches plasma jets, visible from Earth in the form of radio-wave emissions that erupt a few hours or days afterward. Now, in a paper published in the July 6 issue of Science, Natalie Webb of the Université de Toulouse in France has announced that she and her research team have detected those radio emissions at HLX-1 too, strongly suggesting that the object is indeed a not-too-big, not-too-small black hole. "When my group initially found HLX-1 in 2009 using a simple approach, I was extremely skeptical," Webb says. "However, we have observed it in all different wavelengths, and so far it is the first intermediate-mass black-hole candidate that has stood up to so many tests." The most elegant part of the new study is how the researchers used the mere presence of the plasma jets to calculate the black hole's size far more precisely than with the X-rays alone. X-ray intensity correlates to the amount of matter falling into the hole, while radio emissions correlate to the strength of the exiting jets  and both appear to have a constant, scaled relationship to the mass of a black hole. If you know that constant  and it's a pretty standard equation in the astrophysicist's toolbox  you can calculate the mass of the body. While the X-ray readings put the black hole at the very low end of the medium range, the plasma jets boosted it higher  from just 500 solar masses to somewhere between 9,000 and 90,000. That's a big range, but for a first discovery, it's not too shabby. Indeed, says Webb, her calculations represent "the most refined estimate of the mass of HLX-1 and indeed any intermediate-mass black hole proposed to date." The existence of a body in this mass range opens the door to new theories about just what it is that determines a black hole's size. Though all black holes grow by feeding off nearby matter, the source of that matter varies. Small, stellar black holes form as the result of the supernova collapse of a single star. Intermediate black holes may form inside older, glistening star swarms known as globular star clusters. The supermassive varieties are located in the high-density, high-velocity center of galaxies. No matter the size, there is a mathematical constant at work here too: studies suggest that black holes usually represent about 0.5% of the mass of the galaxy or stellar environment they inhabit, regardless of size. It's possible that a small black hole swells to middleweight size as it both collides with and consumes other objects within the confines of a globular cluster. Supermassive black holes could later form through mergers of several intermediate black holes. "Confirming that HLX-1 is an intermediate-mass black hole helps to substantiate the argument that supermassive black holes are formed from intermediate-mass black holes," Webb says. "Without observational proof of their existence, the theory was only speculative." 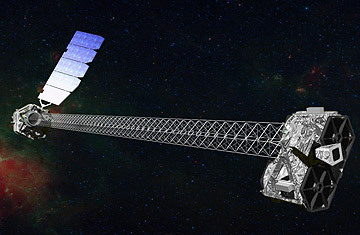 Though HLX-1 is getting all the attention at the moment, researchers are investigating other potential medium-size black holes, including objects within globular clusters in the constellation Pegasus and the Andromeda galaxy. Astrophysicists are also focusing on low-mass "dwarf galaxies" that have had very little interaction with other galaxies, hoping to find intermediate-mass black holes hidden somewhere inside like treats in a cereal box. In the meantime, studies of HLX-1 will continue. "I am very excited that we have finally found the observational evidence to substantiate these theoretically proposed objects," Webb says. It seems HLX-1 is one middle child that will not be neglected.